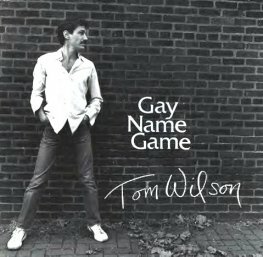 Music for Maniacs: TOM WILSON - "GAY NAME GAME"
TOM WILSON - "GAY NAME GAME"
Back in 2008, I wrote: "One day in the early '90s, I was looking through one-dollar records in a thrift store when I came across one called "Gay Name Game." With a song entitled "Lesbian Seagull" listed among it's contents, how could I resist? The album is a typical sensitive singer-songwriter acoustic relic of the '70s, though the out-and-proud lyrics certainly set it apart from, say, James Taylor. So imagine my surprise when in 1997, in the middle of a mainstream Hollywood film ("Beavis and Butthead Do America"), one of the characters starts singing "Lesbian Seagull." And legendary crooner Engelbert Humperdinck sings it over the closing credits! Eh, what?! I guess Beavis and Butthead creator Mike Judge must have stumbled across this record, too. Thus, a strange curio from the original gay-rights movement enters the mainstream. It is an amazing tune...Caw, caw, caw!" By request, here's the whole album. "Lesbian Seagull" is the classic, as singularly odd, funny and heartfelt as you would expect from that song title, but the whole album is quite a good listen. The way-ahead-of-its-time subject matter certainly holds one's interest, and the witty songwriting of tracks like the title tune rival master satirists like Tom Lehrer (Wilson even outs J. Edgar Hoover way before that hit the mainstream). This was Wilson's first album of a still-going cabaret/musical career. It has never been digitaly reissued.